In the nineteenth-century poet/art critic Charles Baudelaire called sculpture “boring.” Objects that can be approached from all angles, he suggested, fail to reveal an artistic point of view, a subjective vision of the world, unlike painting, which he described as “exclusive and despotic.” Driven by her desire to connect with her subjects, Storer’s work exists somewhere in between these two worlds. She has not chosen, as one might expect, the expressive symbolic medium of painting. But neither does she wish for a more autonomous, universal, birds- eye view. Hers is an intimate, one-on-one engagement, a direct result of her artistic process. As Storer moves from her initial drawings to create her sculptures, she must transcend the two-dimensional narrative plane of her subject. But that is easily done. What is the challenge for Storer is to make that transition while retaining all of those qualities that are encouraged in a two-dimensional subject to grant personality, character, uniqueness, and that have traditionally been found wanting in the objecthood of sculpture without a narrative or even a non-narrative structural support for meaning and responsiveness. In short, the benefits, or universal laws, of subjectivity must NOT be transcended in the process of going from two to three dimensions. How she does this in literal terms and not emphatically is through a methodology that might have been arrived at decisively but has the organic feel of a natural, fluent genesis and maturation by the artist. To create an initial rendering articulated in exactitude, Storer employs the drafting system of measurements of thirds she has long utilized to create a harmonious, naturally-rendered figure. She relies heavily on the fundamental principle that the figure can, in all of its components, be broken down, or built up, by three points. Storer always starts with the same three on the face, from which any other three can be built upon and thus the body is successfully constructed. And this is only the beginning to the realization. Unlike traditional sculpture, these measurements that are exacting do not make allowances for objective three-dimensionality seen from all perspectives, nor for the two-dimensional planes that allow only for a fixed frontal point of view. These are unusually and awkwardly beautiful, the kind of figure to be intensely studied and still have more to offer so much is the essence of their irresistible and likable personalities, a materialization of the “interesting shape” and perspective of it. jutting out while at an angle. All of the drama that is created by the traditional narrative or non-narrative based content, broken, once a two-dimensional representation becomes ruptured and the flat picture plane becomes object, in Storer’s case remains, and is retained as subjectivity for the works of the artist. The process of the actual build commences from the base and from inside outward, delicately and with great finesse. A “formal subjectivity,” a concept new in theory, is manifest according to natural laws and synergy of both two-dimensional precise accuracy of drawing and masterful expertise of skill in rendering perspectival accuracy in three-dimensional ceramics. “Now line and shape combine with volume and all the other elements visual and tactile art can provide to make that connection as poignant as possible between artist and model and you, the viewer,” Storer says of her work. Many artists and viewers see and connect with the personably ineffable and ineluctable charming individualities of each of Storer’s creations. One sees not only with the artist but one sees through her and feels through her. What Storer finds interesting about each of her subjects reveals the kind of artist and human being Suzanne Storer is. This choice is the very raison d’être of her exceptional efforts and the toilsome labor devoted to each subject, revealing great fragility and care, is weighty testimony of a uniquely impassioned creative artistic vision and perspective. Suzanne Storer’s exhibit People, Crows and Ravens is at The Gallery at Library Square in Salt Lake City through January 3, 2014. 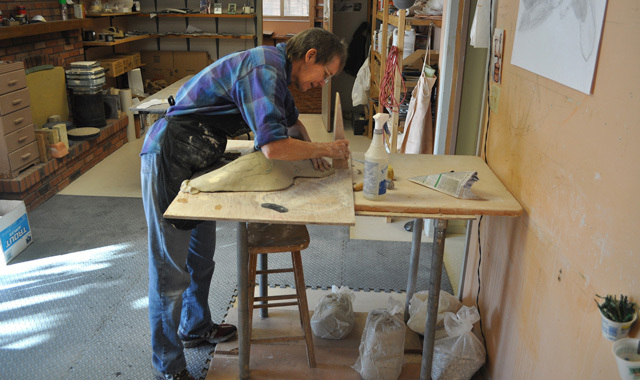 In addition to her figurative sculptural work, the exhibit features what Storer says are the last of her works as a potter. You can view more of the artist’s work at suzannestorer.com.